A small photomicrographic study on the embryonic and larval development of selected cricket species. or the ambitioned hobby microscopist studies on insects may be very interesting for a number of reasons: First, insects can be found everywhere, not only in the garden, but also in the house itself (think of the lovely cockroaches colonizing some warm habitats or the small mosquitoes taking away our sleep in warm summer nights). Second, everyone interested in insects can obtain basic knowledge of these animals within a rather short period of time, because there exists a huge selection of both scientific and non-scientific literature. Third, insects can be prepared very easily for microscopic studies. If, for instance, one wants to study the external morphology of an insect, he can anesthetize the animal in a carbon-dioxide stream or by using Ether (here you should be careful not to narcotize yourself). If, on the other hand, one wants to study the internal morphology of a selected insect, he can fix the anesthetized animal in alcohol and afterwards can produce some longitudinal sections using a razor blade (always consider that insects are also animals, being worth to be protected). The reason for making this small contribution is not only to awake the interest of microscopists for entomology, but also to present some results of studies on insect development, which I carried out some years ago. At this time I examined the growth of embryos and larvae belonging to different cricket species. 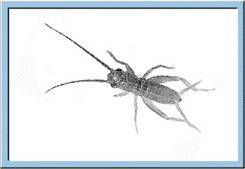 My main interest was focused on the black field cricket Teleogryllus commodus and the house cricket Acheta domesticus. Besides these two species, whose rearing can be realized very easily, I also investigated the development of the North American cricket Gryllus assimilis and the Mediterranean field cricket Gryllus bimaculatus. mbryonic development of hemimetabolous insects like the crickets of this study is epimorphic, leading to the hatching of larvae with fully developed and functional segments (Anderson, 1972; Snodgrass, 1935). At the beginning of embryogenesis stands the so-called zygote, being characterized by a great preponderance of yolk over cytoplasm. Regarding the Orthoptera, egg dimensions are on the order of 2-3 x 0.4-0.6 mm (length x width). In a first step of development, the zygote enters into an early cleavage sequence, in which repeated synchronous nuclear division takes place. This process is followed by the blastoderm formation, whereby the blastoderm itself consists of low, cuboidal cells. A part of the blastoderm changes its density, thereby constituting the embryonic primordium, which subsequently begins to increase in length and becomes the typical germ band (see sketch below). As the germ band increases in length and width, a phase called superficial growth, it extends either along the surface of the yolk mass (typical for Orthoptera) or into the interior of the yolk mass. Superficial growth is also accompanied by the successive segmentation of the germ band. After this important step of embryonic development, the segmented germ band is marked by a total immersion within the yolk mass, a phenomenon termed blastokinesis. After formation and segmentation of the germ band, gastrulation and related movements take place, extra-embryonic membranes are established, somites and ganglions are formed, and appendage buds are subject to further differentiation. At late stages of embryogenesis dorsal closure is carried out, being a requirement for functional differentiation of the epidermis and secretion of the first nymphal cuticule. Now follows the internal organogenesis and, at last, the resorption of the remaining yolk mass – embryonic development is finished. Figure 1: Animated sketch illustrating the main stages of the embryonic development, which can be observed for orthopterans. reparation of the eggs for light microscopy: Cricket eggs with different developmental stages of the embryo (i. e. eggs being subject to different incubation times) are under normal circumstances difficult to study, because their chorion is marked by full opacity. To overcome this problem, a specific fixation procedure is applied (Groepler 1981), which modifies the optical characteristics of the chorion. For this, eggs are transferred into a mixture of alcohol, formol, and acetic acid (50:30:5) and are subsequently incubated at 40 °C for about 1 hour. After this procedure, the eggs are washed and stored in ethanol (70 %). For light microscopy, single eggs are transferred on a glass slide (55 x 17 mm) and covered with a cover glass situated on wax spheres. Figure 2: Photomicrographs of embryonic stages of the house cricket Acheta domesticus (bars: 1 millimetre). a – zygote, b – start of embryonic development with formation of the germ band, c – mid-stage embryo with segmented body and development of thoracic/abdominal extremities, d – nearly fully developed embryo immediately before the dorsal closure, e – fully differentiated embryo before hatching, f – hatched larva of Acheta domesticus. Click image to view larger (inactive in Explorer browser). Figure 3: Detailed photographs of cricket embryos. a – mid-stage embryo, b – fully differentiated embryo, please note also the changes concerning the egg volume. Click image to view larger (inactive in Explorer browser). hortly before the hatching of the young larva, the fully differentiated organs start their function, and an embryonic cuticule is formed. Heart activity and intestinal peristalsis are initiated, leading to an uptake of amnion liquid and, as a consequence, to an increase of the embryonic body size. Single tracheae representing the respiratory system of the insects are filled with air, and supply of the organs with air is started. After the initial processes described above, the larva is ready for hatching (see animation below), whereby the opening of the chorion is caused by local increases of pressure induced by the contraction of specific muscles. Regarding the crickets, opening of the egg is also facilitated by specific perforation lines, along which the chorion cracks during pressure increase. 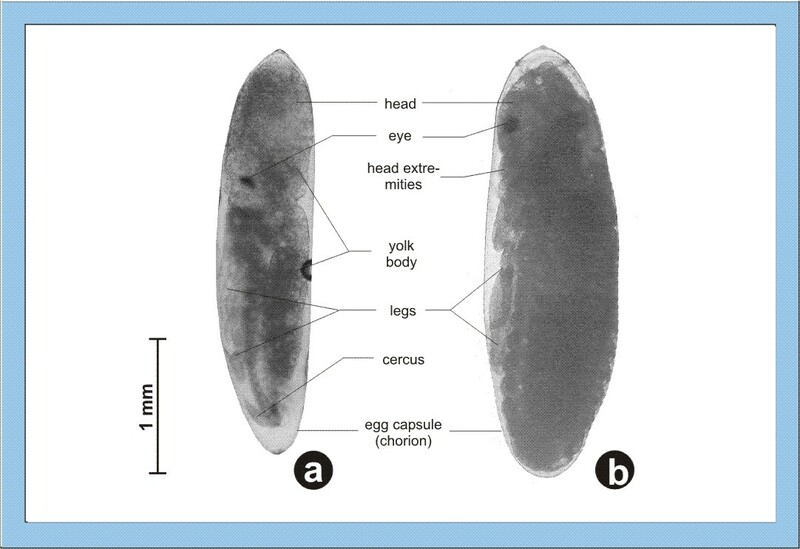 After opening of the egg, the larva leaves the capsule by either using the extremities or by peristaltic movements of the thoraco-abdominal muscles. These movements also cause the ecdysis of the embryonic cuticule (i. e. hatching is coupled with a first process of moulting). 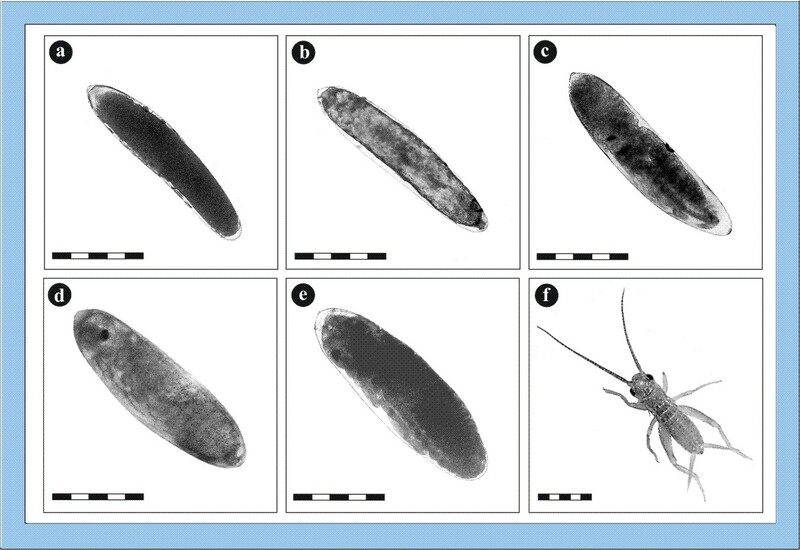 Now, the larva is characterized by full motility and the definition of its final habitus (Weber, 1974). Figure 4: Animated sketch showing the process standing behind the hatching of young larvae out of the egg capsule. 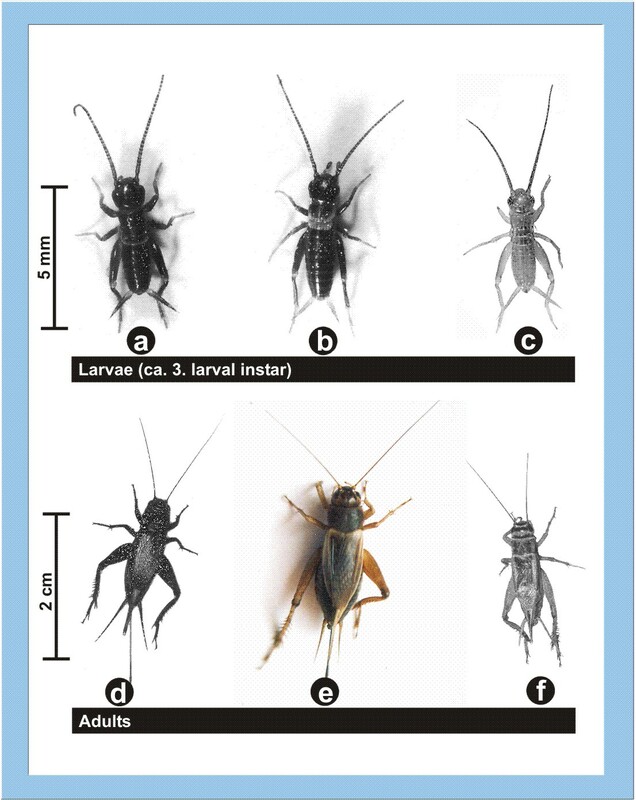 ithin the larval development, extern morphology of young crickets successively approaches the habitus of the adult animal, whereby each step of growth and differentiation is preceded by a larval moult. Besides a continuous propagation of somatic cells, being already an essential characteristic of embryogenesis, additionally a strong cell growth occurs, increasing the body weight by a factor of 30 and the body length by a factor of 10 to 15. A further property of larval development is the permanent modification of body proportions, i. e. the head is exceeded in size by the thorax, and the abdomen becomes the dominant part of the insect body. The first occurrence of the anlagen of the wings can be observed between the 7th and 9th larval instar (see also sketch below), whereby the initially formed lateral and dorsal wing sheaths are subject to a successive enlargement. Regarding female larvae, formation of the ovipositor from the two terminal abdominal segments uniformly starts with the 7th instar. Tympanic organs responsible for the perception of acoustic signals are developed during the final instar of the larvogenesis. After the imaginal moult, external processes of differentiation are completed, whilst organs of reproduction partly need a further development causing the sexual maturity of the insect (Snodgrass, 1935). Figure 5: Animated sketch illustrating the larval development of crickets, which especially is characterized by an exponential increase of body size and body weight. Figure 6: Larvae and adults of three different cricket species (a, d - Teleogryllus commodus; b, e - Gryllus assimilis; c, f - Acheta domesticus). Click image to view larger (inactive in Explorer browser). Anderson, D. T. (1972): The Development of Hemimetabolous Insects. In: Counce, S. J. & Waddington, C. H., Developmental Systems: Insects, Volume I, Academic Press (London, New York), p. 95-163. Groepler, W. (1981): Das Experiment: Embryonalentwicklung Wanderheuschrecke. Biologie in unserer Zeit, 11, p. 91-94. Snodgrass, R. E.(1935): Principles of insect morphology. MacGraw-Hill (New York). Weber, H. (1974): Grundriss der Insektenkunde. 5. Edition, Fischer-Verlag (Stuttgart). Any questions of interested readers are very welcomed. You can contact the author under the following email address: E-mail address. Published in the March 2006 edition of Micscape.